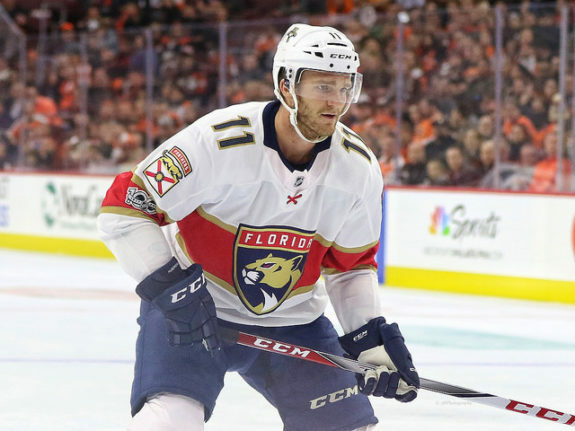 With the acquisition of Mike Hoffman earlier this offseason, the Florida Panthers may have finally assembled the complete, high-end top-six that has eluded the franchise for at least a decade. It has been a pronounced issue recently, as they have had talented pieces in their top-six but also had holes that prevented the team from achieving greater success. 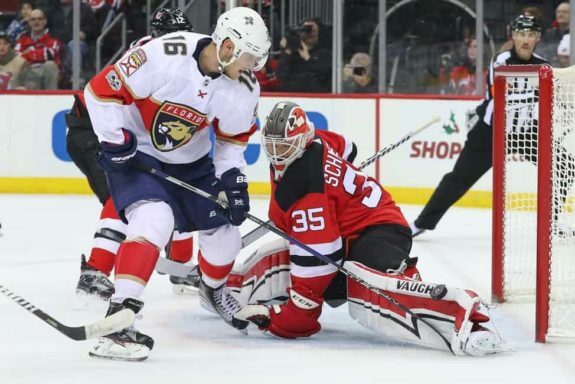 Because of these voids, the Panthers have not reached their expected success level, as they were forced to over-rely on a few offensive pieces to carry the load. 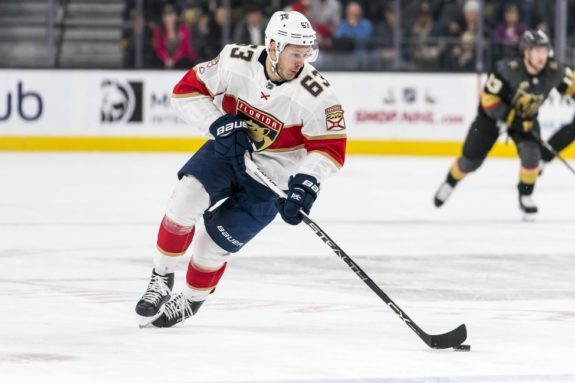 Jonathan Huberdeau, Aleksander Barkov, and Vincent Trocheck have been the main trio of top-six forwards for the Cats over the past several years. They have accomplished much in their short time and continue to prove their top-six distinction. While other “pseudo top-six” players have come and gone, these three have maintained that status. After the big three, you are left with a laundry list of players who were either forced into a top-six role undeservingly, left their primes before the big three fully developed, or demonstrated top-six potential but could not consistently put it together. There were also players who were dealt away for nothing to the Vegas Golden Knights and then went on to post career highs and served as the driving force to lead Vegas to the most successful inaugural season in history. Next season might be different for the Panthers, all for the better. Last year, Evgenii Dadonov returned to the Panthers after several years in the KHL and played well. 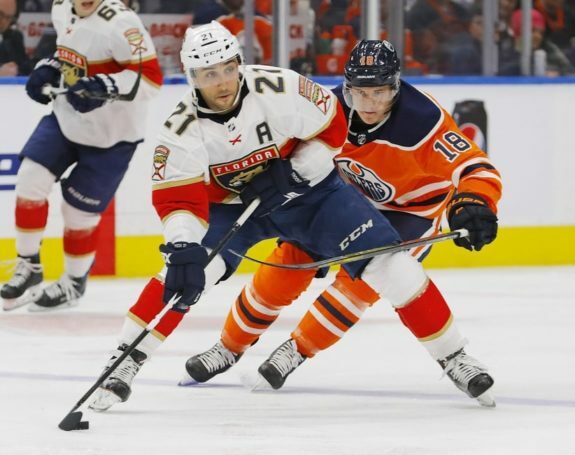 He found instant chemistry with Huberdeau and Barkov, displayed high-end speed and puck movement, and was one of the few players who carried the offensive load for the Panthers. 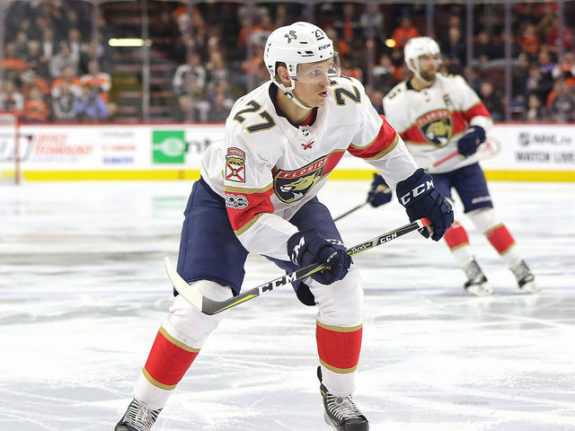 Nick Bjugstad earned top-six minutes for stretches and, when playing alongside Barkov and Dadonov, he looked his best since his career year in 2014-15. Henrik Borgstrom, an NCAA phenom and the potential steal of the 2016 draft, is set to compete in his first full NHL season, most likely in a top-six role. As it stands, next season’s top-six is brimming with talent, offering options for line combinations. In fact, the only guaranteed lineup positions on offense are first and second-line centers, Barkov and Trocheck, respectively. After that, it seems up in the air where the wingers are slotted, given the team’s surplus. Because of this, no one is a safe bet to be a first-line winger. It is a tremendous position to be in and an exciting one at that. 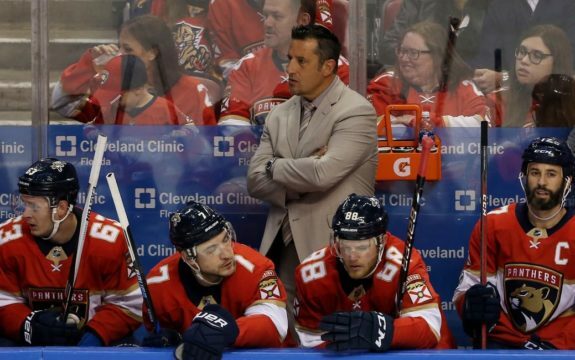 But it is also a question that head coach Bob Boughner will be pondering all offseason. So, let’s toy around with the possible candidates to play alongside Barkov, one of the game’s best two-way centers. For this, we will look at the whys and why nots for each candidate and identify who the best set of wingers are for him. We lead off with the Russian winger as he seems the likeliest to earn a first-line role. The reason? He had this role for the vast majority of last season. Dadonov began the season playing with Huberdeau and Barkov and ended the season playing with Bjugstad and Barkov. It is a position he is familiar with has earned. Dadonov flourished on the first line and surpassed his earlier career totals. He and Barkov instantly clicked last year and put up monster numbers. In the first few months of the season, Florida’s top line almost exclusively carried the load for the Cats, performing as one of the best lines in the league for stretches before Dadonov went down with an injury. Ultimately, because of the line’s success and the abysmal support from the other lines, the trio was split to distribute scoring, but even when Bjugstad joined the line, Dadonov continued to produce. Because Dadonov played almost exclusively alongside Barkov, chemistry is another factor in his insertion as the top-line right winger. It takes time to develop chemistry and to get a feel for where your linemate is going to be. It is invaluable and something that is not innate. It needs to be practiced and perfected. And with one full season in the books, it may be best to let the chemistry continue to grow for Barkov and Dadonov. The duo also has complementary skills. Dadonov is speedy and can get open and break away from defenders while Barkov is an elite passer so having a shifty winger that can create space and get open for a pass is a recipe for success. For Barkov, this speed helps in the transition game. Dadonov can break in and out of the zone quickly, with or without the puck, forcing the defense on their heels. Aside from speed, Dadonov is creative with the puck and is not over-reliant on Barkov to set him up to generate offense. He also has a scoring touch, evident by his 28 goals. His scoring touch is one of the best on the team, though Trocheck and now Hoffman are arguably better and more accomplished. Regardless, it is a skill that a first-line player needs, especially on a line with a playmaker like Barkov. And not for nothing, with Huberdeau and Hoffman both listed as left wingers, Dadonov is markedly the best right winger on the roster. There really aren’t many reasons to not put Dadonov on the first line. His skill, intangibles, and chemistry with Barkov all equate to playing time on the first line this season. However, there is one reason to keep off the top line: he is not the best Panther at a specific skill. Now in no way, shape, or form is this discrediting him. In fact, in some ways it praises him. He is a fantastic player with skills in different offensive disciplines, making him highly versatile and beneficial to the roster. But there are better options on the Panthers when it comes to specific areas. Certain players on Florida’s roster have demonstrated themselves as better, more successful playmakers than Dadonov. There are also scorers on the roster with harder, more accurate shots than him and with the resume to back it up. And if size and strength is a dimension Boughner wants on the first line, those are attributes that Dadonov does not offer. He is great in most areas but elite in few, or perhaps none. Huberdeau has been one of the best Panthers for the last five-plus years. He is a bonafide first-line talent and has played that role for a number of years. Though he is already a perennial 50-point player, last season demonstrated what he can be. He reached career highs across the board while playing top minutes against the league’s best. Injuries hampered him early on, but it seems like he is ready to become an elite offensive weapon as he nears his prime. Skill is something he is far from short on. After Barkov, Huberdeau is the second-best playmaker for the Panthers and is one of the best in the league. He dazzles with the puck on his stick, stickhandling around opposing players at both ends of the ice. His passing is incredible, as he is able to fit the puck in microscopic gaps onto the stick of an open teammate. 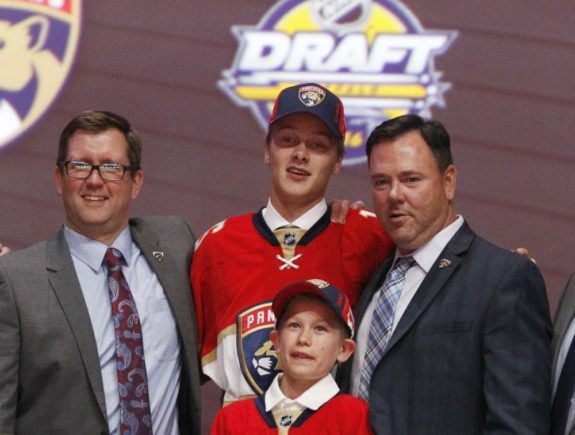 He, like Barkov, is able to create offense for his teammates unlike any other Panther. Huberdeau is also a strong, sturdy presence on the ice. While not overly big, he has size to battle in the corners, along the boards, and to fend off defensemen when skating towards the opposing net. He can skate around you and through you if need be. To be a first-line forward, you need to have tools in your arsenal, from puck handling to speed and strength, and Huberdeau is one of the most versatile. Like Dadonov, Huberdeau has chemistry with Barkov, but in his case, this chemistry dates back years. The two have developed together, have played together and apart in the lineup, and have a relationship on and off the ice. Two reasons stand out for playing Huberdeau away from Barkov. The first is the fact that both play a similar style. Each seeks to generate the offense for his teammates rather than finish plays. Many times last season, both looked for the extra pass rather than shooting the puck. When you have two players on a line looking to pass rather than shoot, you need to have a shooter paired with them to finish plays. Huberdeau’s playmaking ability may be best served alongside Trocheck on the second line. Trocheck is not afraid to shoot the puck and has the ability to finish. This complementary skill set was on display last season after Huberdeau moved down to the second line. Trocheck has scored 20-plus goals in each of the past three seasons, including a 31-goal campaign last season when Huberdeau was on his wing part of the time. Huberdeau provides stable offensive support for Trocheck, a luxury he did not have in years prior. The second reason is that though Huberdeau is capable of finishing plays and possesses a quick shot, it is a reach to call him a sniper. There are other options Boughner could entertain to give the first line a scoring punch. It would be wise to play an established scorer with the best playmaker on Florida, that being Barkov. With Barkov at center and a scorer at right or left wing, that may be enough to drop Huberdeau down to line two. 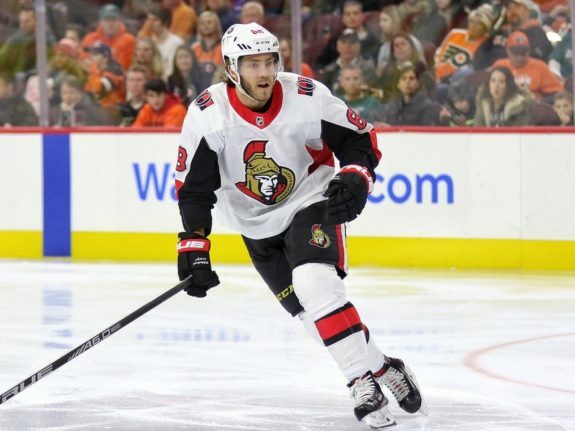 Acquired from the Ottawa Senators, Hoffman has four straight 20-plus goal seasons and is just beginning his prime years. You can pencil him in for 55-60 points regardless of his team’s success and in the mid-to-high 20s for goals. His shot is blistering from the wing, a skill that Florida has not had in recent seasons. What happens when you put one of the best passers in the game with a scorer in his prime? We could see it if he plays with Barkov, perhaps more so if Huberdeau is also on that line. Sure, Hoffman has not had a 30-goal season, so people may be wondering why experts are high on him as a goal scorer. But all you have to do is watch a game to see how fast his shot is and how quick his release it. Though it is speculation, it is not hard to believe that if Hoffman was on a different, more skilled team he would have bested 30-goals by now. 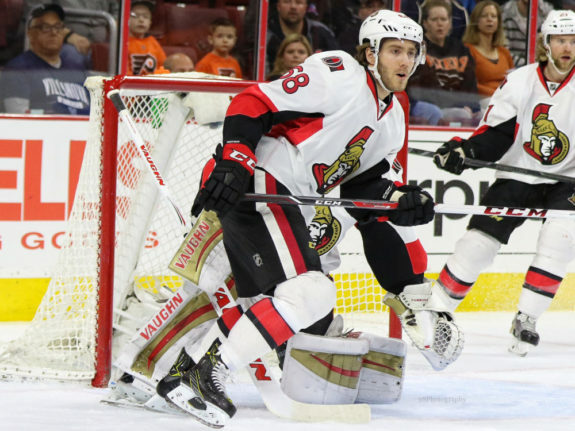 Last season he was not playing with the most offensively capable linemates, either, playing with Jean-Gabriel Pageau and the shell of Bobby Ryan. You can still get a taste of what Hoffman can do with a skilled playmaker centering him when he lined up with Matt Duchene on the power play. Hoffman posted 13 goals and 26 points after the Senators acquired Duchene, doubling his totals from before the trade. Though goal scoring is his biggest advantage relative to the other candidates, Hoffman has other skills that support first line merit. He has great speed, with and without the puck. Though not as gifted a playmaker as Huberdeau or even Dadonov, he still hovers in the mid-30s for assists, moving the puck effectively in the offensive zone and is not one-dimensional. Hoffman also brings a veteran perspective and playoff success to whatever line he is on, which is worth considering. Hoffman has 14 points in 25 games in two trips to the postseason. He knows the game, has experienced the highs and lows of the sport, and has the skill set to make him a target as Barkov’s linemate. First and foremost, Hoffman has zero chemistry with Barkov or with any Panther for that matter. Now that should not be a dealbreaker, but is it worth taking a risk while sacrificing a line combo that worked well last year, and a line that developed chemistry in the process? Huberdeau, Dadonov, and Barkov worked well last year. Hoffman also has no chemistry with Boughner, which could be a larger issue for Hoffman. Boughner has experience coaching all of the other candidates. The line combos may be as simple as who Boughner trusts and feels comfortable with, regardless of skill. Another factor is that Hoffman and Huberdeau play the same position. It is not a foregone conclusion that Boughner won’t elect to play two left wingers on the same line, but logistically it makes more sense to have one left winger and one right winger. It may come down to Huberdeau or Hoffman on the left side. Lastly, Hoffman is a capable playmaker in his own right, but other options exist that would serve better in moving the puck around. Puck possession is a stat that continues to grow in importance, especially in the minds of NHL coaches. It would serve well in that metric for a first line tandem of playmakers to possess the puck their entire shift against opponents’ top lines. Possessing the puck in this manner would lessen the zone time for opposing teams while spreading out the puck to generate scoring chances for the Panthers. If that is the game plan, Hoffman may not be a top choice for first line minutes. When Boughner mixed lines up after the halfway point last season, Bjugstad supplanted Huberdeau on Florida’s top line. It was somewhat unexpected, in fairness. Bjugstad is a big, burly player without the footspeed of Barkov and Dadonov, but with a dimension that a throwback to when Jaromir Jagr played alongside Huberdeau and Barkov. Bjugstad is a strong, sturdy player capable of using strength to possess the puck and create plays, which worked for Florida years ago. Though the experiment cannot compare to the success that Jagr’s rendition had, it was successful. Bjugstad had a career year playing roughly half the season on the first line. He did not look out of place alongside quicker center and right winger and was helpful in leading the Panther surge late in the season. An argument can be made that without Bjugstad playing as well as he did, Florida’s resurgence into contention would not have happened. Perhaps the biggest reason is that Bjugstad has not found that success on other lines. For him to be this successful, he may have to play alongside Barkov. Playing on the first line turned Bjugstad’s game around and that could even get better playing on Barkov’s line for a full season. So not only does Bjugstad’s production improve, production across the team opens up as Boughner could then slot a goal scorer or playmaker in with Trocheck on the second line. Though not a perfect comparison, look at what Tom Wilson did with the Washington Capitals last season, and you can see why Bjugstad might be the right player on the first line. It also gives the line a new look. Bjugstad’s size and strength is incomparable to any other Panther forward. Sure, Jamie McGinn brings some size and strength as well but without the speed. 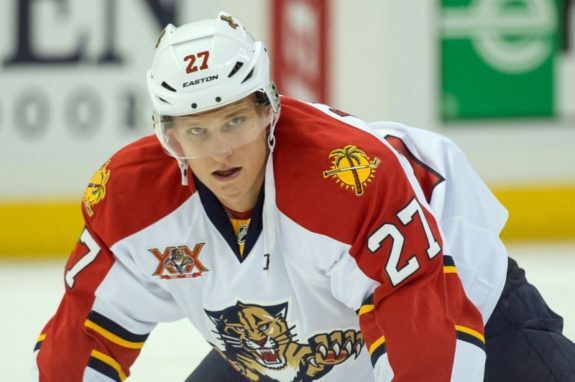 If Boughner wants a bigger presence on the first line, it is Bjugstad or bust. Bjugstad will almost assuredly not be on Florida’s first line next season. He may not be a second line player either, but that is a different issue. When you compare what he can bring to the line, it is not enough compared to the other candidates. He is not a sniper and not an elite playmaker. And for as big as he is, Bjugstad does not create offense with the puck like he should. Most importantly, he has zero finishing touch around the net. The guy cannot finish, which is a necessity for first line minutes when you are not creating offense for others. Numerous times last season he was put in quality scoring positions and either shot it wide or into the goalie. It is a shame because he has a knack for getting open in quality scoring areas, and does it often. But as skilled as he is, he does not bury the puck and for that reason, he is not a first-line player. If you do not follow the Panthers, NCAA hockey, or NHL prospects, Henrik Borgstrom may not jump out at you. But if you are even a casual fan, there is a decent chance you have watched his highlight-reel goals on a social media channel. The 23rd overall pick in the 2016 draft, many viewed him as a reach by the Panthers when they selected him. But that was 2016. It is now 2018, and he may end up becoming one of the best players in that draft. Borgstrom excelled in the NCAA his freshman year, posting 43 points in 37 games. His sophomore season was more of the same, with 52 points in 40 games and he was a Hobey Baker Finalist as the NCAA’s top men’s ice hockey player. Borgstrom’s stickhandling is unfathomable. He can deke with the best of them, leaving not just one but several defenders wondering where he went. He can also blaze by skaters with his terrific speed. Pair this with his stickhandling and he is one of the most lethal players on the ice. Though not the hardest shot, he can also get the puck off quickly and accurately. But making plays is what Borgstrom does best. Whether getting around players himself, or dragging defenders in and dishing the puck off after they commit, he has a full arsenal at his disposal for generating plays. Throw his speed and stickhandling on a line with Barkov and see what kind of highlight-reel goals are produced. He is almost guaranteed a top-six role this fall. His skill set, for better and for worse, warrants that. He does not have the size, strength, or the defensive ability to start on a third or fourth line. Borgstrom’s value is exclusively offense. Because of this, he needs to be placed on a line with other fast playmakers and finishers. Florida is in a unique situation in that Borgstrom could work well with Jared McCann and Denis Malgin on the third line, but even then there is a level of defensive responsibility that Borgstrom has yet to display. But he is just too good for the NCAA and probably the AHL, so he needs to be placed in the best opportunity to succeed. What better opportunity is there than on a line with Barkov? Borgstrom should not play on Florida’s top line, but as a surefire top-six player to begin the season, his name needed to come up as a candidate. A rookie should not be thrown to the wolves, against the league’s best, right at the start of his career. He needs time to grow, build confidence, and develop. He does not have a full 200-foot skill set yet and therefore needs time to develop it. He may have the offensive capabilities to warrant an attempt on the first line, but he ultimately is best served as a second line winger. Florida is in a great position when the 2018-19 season rolls around with so many wingers to play around with. Will Boughner go with all playmakers on Line 1 with Dadonov and Huberdeau? Will Hoffman make a first-line debut, providing massive scoring potential for Barkov and his playmaking prowess? Or maybe Boughner will ignore position titles and pair Huberdeau and Hoffman instead. The options are endless for the Panthers this season, and only time will tell the outcome. Regardless, it is an interesting story to follow as the offseason progresses and the preseason begins. *All stats came from Hockey-Reference.